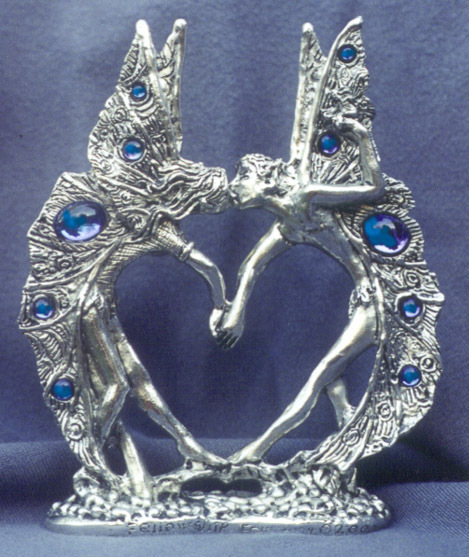 These beautiful fairies hold hands as they lean in for a kiss. Her clothes are accented with leaves and he wears a knife on one hip. They each have a tiny fairy perched on their left hand held high. Their wings are encrusted with Austrian crystals (on both sides). We intended this top a wedding cake, but it is a stunning sculputer on it's own. We make it by hand from lead-free pewter with crystals. The base is 3 5/8 inches long by 1 1/8 inch wide.